This post was written by our friends at Clutch. 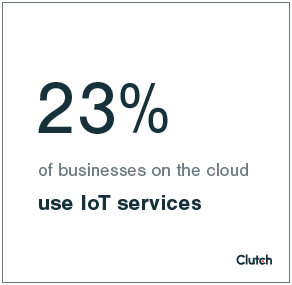 Clutch, a leading B2B IT research firm, recently conducted a survey of nearly 300 IT professionals at businesses across the United States that use cloud computing. The survey found that nearly 1 in 4 businesses are using IoT services in the cloud. Jamie MacQuarrie, co-founder of Appivo, provided expert commentary for the report. MacQuarrie described the dangers currently present when it comes to the Internet of Things. The state of IoT security is often not seriously considered, despite real risks. These overlooked devices can be entryways for hackers, even if they seem harmless. “Consider an auto plant with automated manufacturing lines sending data to a cloud for analysis… it’s probably tightly secured because a hacked production line means serious down-time that directly impacts the bottom line,” said MacQuarrie. MacQuarrie mentioned the famous 2013 hack of Target’s payment systems, made possible through a remotely accessible HVAC system. MacQuarrie believes there is hope for IoT security, but improvement may not come from the consumer side. It remains to be seen what is in store for the future of IoT security. The survey report also discusses a range of other cloud security topics, including spending and popular regulations. Other data shows that the majority of businesses are spending $100,000+ on additional cloud security features, and 65% of businesses follow regulations from the Cloud Security Alliance. Riley Panko is a content developer and marketer at Clutch, a B2B research firm in the heart of Washington, DC. Her research focuses on the cloud. Reach out with questions, comments, or concerns at riley@clutch.co.